I awoke at 6:30 AM. Nobody woke me for my watch because Bert rose during the night and relieved Nancy. I did not mind. I relieved Bert and enjoyed the quiet time on the bridge to get organized and do some writing. The quarters A/C blew the replacement capacitor during the night. It was an old cap so I was not surprised. I dug into the ship’s stores and found more caps and some “rescue kits” which are capacitors that have built-in electronic protection. Very handy that Bert had those in stock. In order to check all of the electrical components on the A/C compressor including the sensor switch on the side of the compressor housing I had to tear the electrical box apart because it was assembled with pop rivets that were not accessible, so I couldn’t drill them out. Oh well. Everything checked out fine so I installed the special self-protecting capacitor and the compressor worked fine, and continued working fine for the rest of the trip. Bert then cooked up a pancake breakfast and I spent most of the day taking photos and keeping an eye on the machinery. 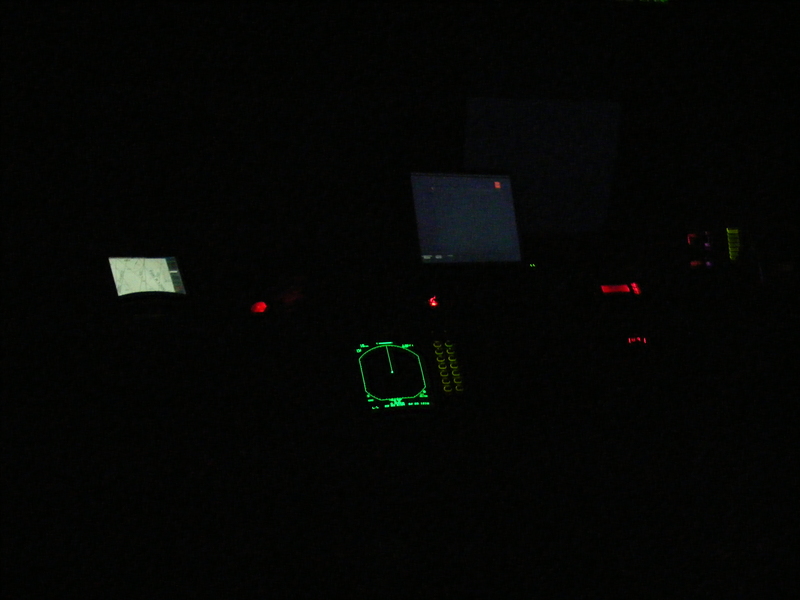 The bridge of M/V Vagabond at night. Nothing on the radar. Yay. Click to view larger. 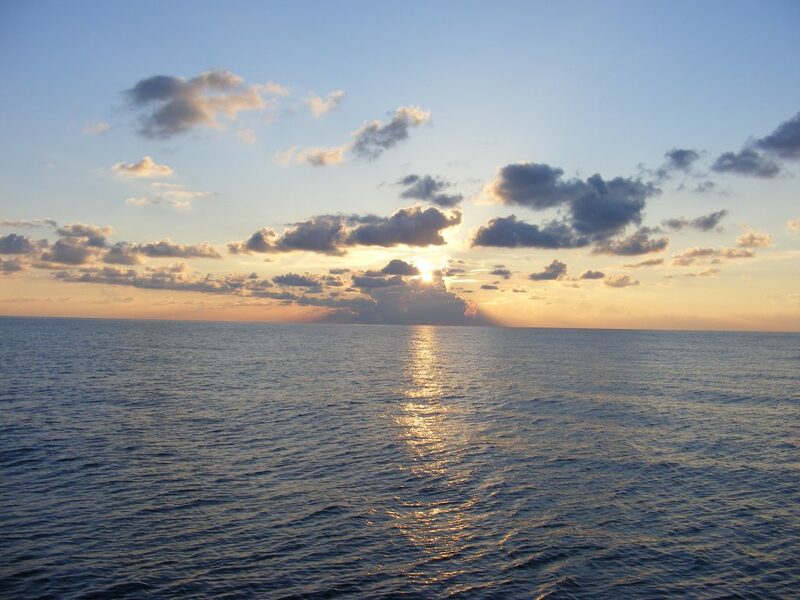 Early morning in the Gulf of Mexico, north of Cuba. Notice the chain from 25 foot long starboard stabilizer boom to the water. That chain runs down to a heavy steel stabilizer bird with wings that “flies” from 8 to 12 feet underwater. 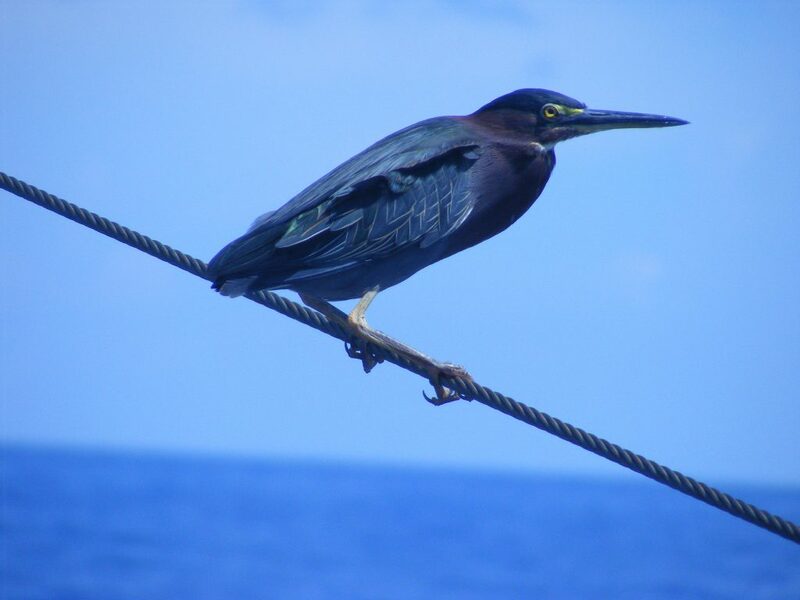 The bird is designed to fly forward through the water with little resistance. The bird will readily dive deeper but resists being pulled up. There’s one on each side of the boat. These greatly reduce rolling motion of the boat for a smooth ride. Click to view larger. Early afternoon Bert stopped the boat for a swim. With the main engine shut down and before I went swimming I added two more liters of oil to the engine. Adding oil seemed to improve the overheating problem. Now with the engine stopped I could get an accurate dipstick reading. The oil level was indeed low. 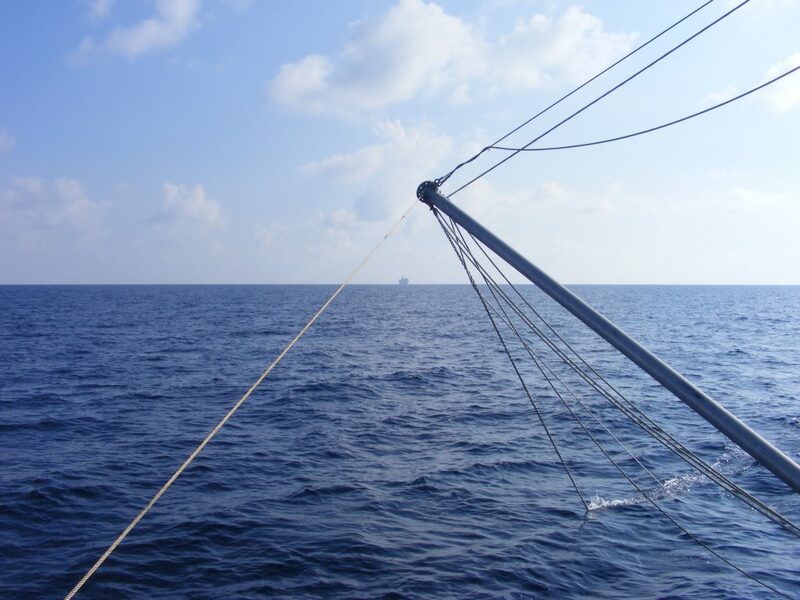 This is the port stabilizer boom with chain running to the bird underwater, as explained above. Notice the ship in the distance. Click to view larger. The swim was fantastic. The water temperature was perfect and this time the water was not just tropical clear but absolutely clear. The last time we stopped there were some little bits of sargasso seaweed in the water but this time it was so clear it was unbelievable. The water at this spot was 11,000 feet deep and there was absolutely nothing in the water. Visibility was unlimited. No matter how far I swam from the boat, with my dive mask on, underwater, on it looked like Bert and Nancy were right next to me. Visibility was perfect. The bright sunlight allowed me to see a long way down and I spent quite a while just floating and staring down into the water. The sunlight reflecting and refracting up from below was a spectacular light show. I never saw anything in the water; no fish, not even a single particle of anything in the water. One odd thing I noticed was the saltiness of the water at this spot. It was extremely salty, saltier than any seawater I’ve ever tasted. It was so salty it made my eyes burn. 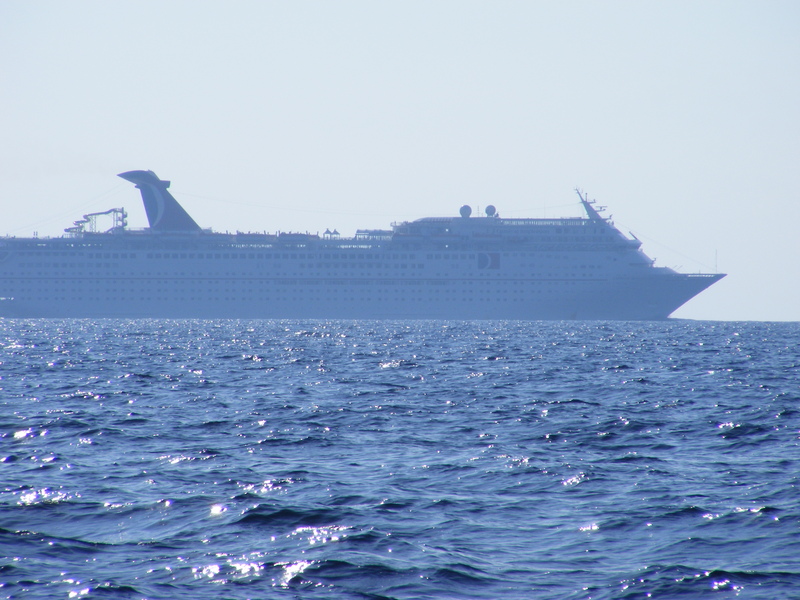 Carnival cruise ship approaching to pass us astern. Click to view larger. 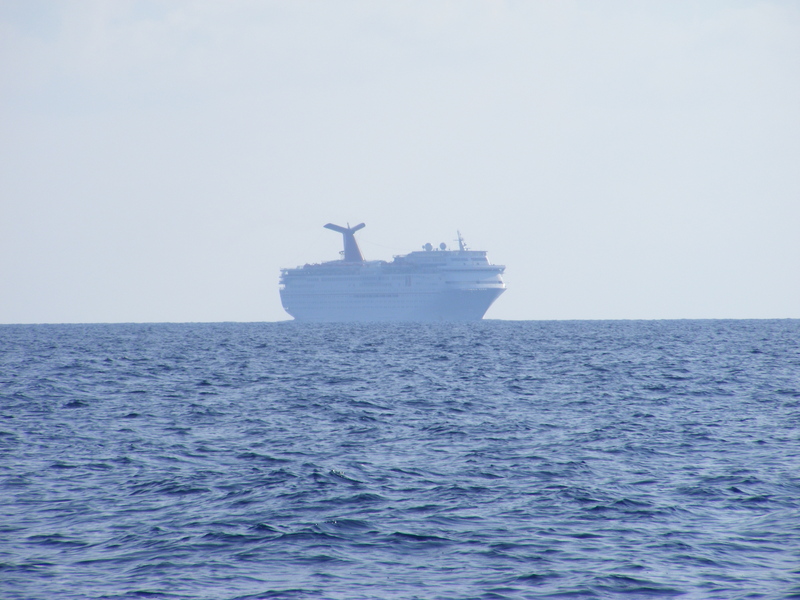 The same Carnival cruise ship after passing behind us. Click to view larger. We showered in fresh water and got underway again. It seems the slight overheating of the was caused by a combination of low oil, plus a partially clogged keel cooler, plus 93 degree seawater. With another two liters of oil the engine temperature dropped four degrees back to where it is supposed to be and I reset the alarm back down to the correct temperature. I made triple backups of my photos thus far and developed a scheme for running regular backups of the several gigabytes of photos I expected to take along the way. I sent a short email to my daughter via Winlink so she would not worry. We are sailing ahead of Hurricane Gustav, across its likely path, so we are making all possible speed for Isla Mujeres. The hurricane is still more than 700 miles away so I am not worried but better safe than sorry and we are watching it very carefully. At Isla Mujeres we only plan to make a technical stop, take on fuel, and keep going, getting to Rio Dulce, Guatemala as quickly as possible. This heron was tired. We’re 100 miles from the nearest land, the northern coast of Cuba. He stopped to rest for a while and seemed completely unafraid of me. Click to view larger. 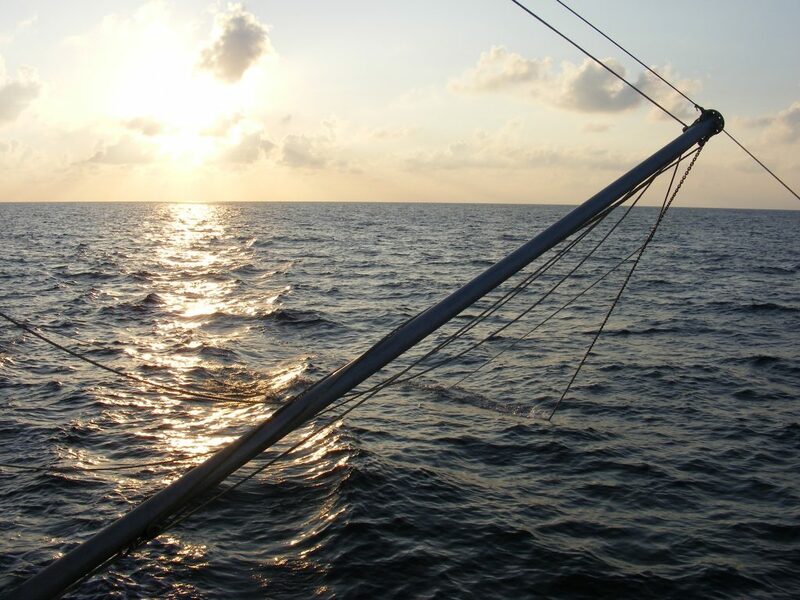 Sunset in the Gulf of Mexico, north of Cuba. Click to view larger. Bert cooked up a huge dinner of steak and mashed potatoes. After dinner I did some writing and then went to bed. Nancy has the first watch.